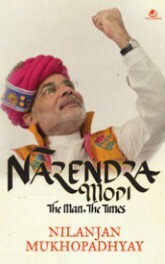 For political India Narendra Modi is very much the up and coming man. He has been making his presence felt on the political landscape for a long time, most specifically during his first stint as Chief Minister of Gujarat when he found himself at the vortex of a Muslim pogrom, part of the Godhra incident fall out. The question was did he order it or did he not, a question which still continues to be asked as Gujarat’s Chief Minister goes from strength to strength, especially now when he is aiming for the Prime Ministerial post. Journalist Nilanjan Mukhopadhyay has been covering Modi’s career for a long time. ‘When he was seventeen, Narendra Damodardas Modi had an extra middle name—‘Trouble’’ Mukhopadyay wrote in an Outlook newsmagazine piece.